being little • bristol uk fashion & lifestyle blog. : waiting for spring. Love the little cardi, compliments the playsuit very well! Looks like Primark has come up trumps again! Loving the outfit! Love this outfit, the cardigan over the top is really cute! Such a cute playsuit (: I remember nearly buying it but there were no more left in my size and all the hangers were sorted in the wrong order, so I left in a failed-shopping rage haha! I love this playsuit! I almost bought it but it was really unflattering on me. It looks great on you though, very cute! so cute! love it on you! 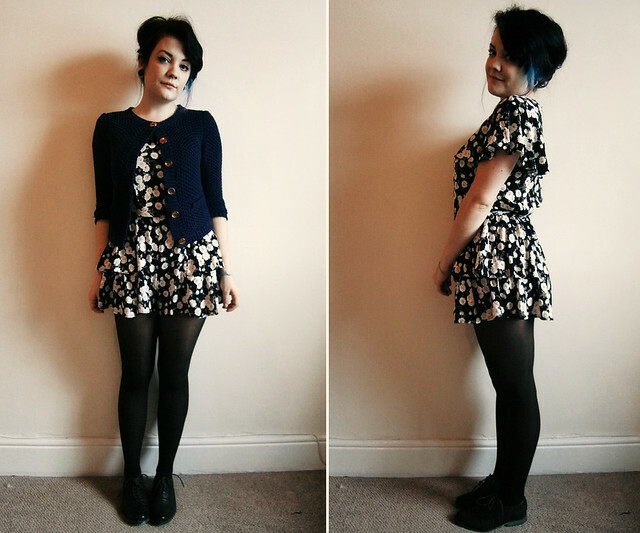 A playsuit is almost my staple now! They're so easy to wear! I have this exact outfit, apart from my cardigan is pink not blue :) Playsuit really suits you, can't wait to start wearing it in summer! Stunning little print on that playsuit! me too, i need some warmth too! So sweet, I never would have guessed it was Primark. Amazing :). You are continually inspiring me to put some sort of color streak through my hair, you look gorgeous! really nice, and you're totally right, you don't really need to spend a fortune to look good. awesome example. love the blog and your outfits! have a lovely weekend! Ahhh you are the cutest thing ever!